# Bbox object around which the fancy box will be drawn. # boxstyle=square with pad=0, i.e. bbox itself. # draws control points for the fancy box. # bbox=round has two optional argument. 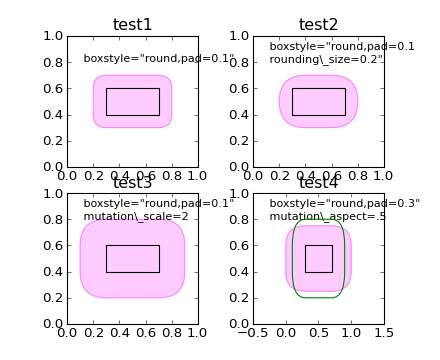 pad and rounding_size. # They can be set during the initialization. # forgotten even if the boxstyle name is same. # You can compensate this by setting the mutation_aspect (pink).